MindSwarms has been used in early stage R&D, Design, Marketing, and all the way through to Advertising. Some of the most successful innovations come from deeply understanding the target audience from the get-go. R&D clients have embraced MindSwarms as a way to get into the heads and hearts of consumers while very early in the R&D process. Design firms were amongst the earliest adopters of MindSwarms, inclduing influential studoes like MNML, fuseproject, and Astro Design. They have used MindSwarms for a broad range of occasions. Marketers and advertisers are only just begining to scratch the surface of how MindSwarms can be used. Independent researchers and research firms have been brand loyalists of MindSwarms because it helps them collect video-based feedback from consumers all over the world. With these insights, independent researchers have either developed their own analyses or hired us to help them with analysis and reporting. 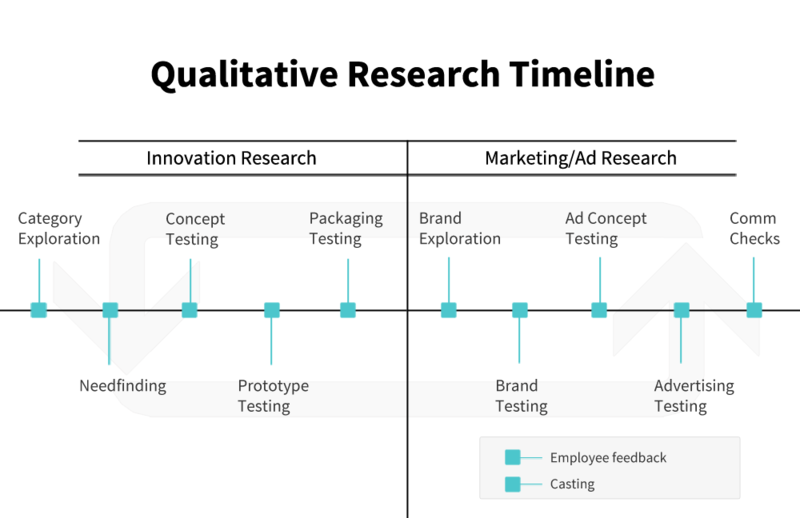 Situation:While marketers and brand teams have dedicated budgets for qualitative consumer market research, R&D departments often don’t have that same luxury. They are working so far upstream in the development process and are typically ahead of consumers that the idea of need-finding research for R&D is less common. However, as development and design cycles shrink, and digital platforms continue to disrupt the R&D process, MindSwarms can be exceedingly helpful in identifying genuine consumer needs very early on in the R&D process. Solution:Before anything is actually made, MindSwarms has proved to be an invaluable tool for R&D professionals looking for a quick-strike way to bring the intended target audience into the conversation to get insight and inspiration for what could be made. By using MindSwarms in the need-finding stage, R&D professionals will be transported into the lives of the intended target audience to establish empathy with whom they are targeting. Situation:In the ideation phase, often times multiple concepts are bandied about inside the corporation as ways of solving the problem. While internal feedback is helpful and generative, having real consumers react and respond to insight territories or rough ideas is enormously helpful to gauge the potential interest and criticisms. Solution:Having even a handful of consumers react to early stage concepts can help winnow the potential field of ideas down to fewer ideas to focus on. By posting a PDF to specific ideas, or having consumers elaborate further on potential idea territories helps fuel the R&D team with knowledge and confidence. Even terminating an idea in its early stages can be far more economical than continuing to work on something that consumers don’t relate to at all later in the process. Situation:Often-times, early on the design phase, there are multiple potential paths. But which one is most likely to strike a nerve with consumers in the real world? With 9/10 new products failing at launch, flying blind can end in disastrous consequences. Solution:Gathering early feedback on concepts under consideration has helped a multitude of clients not only refine designs, but also uncover unexpected twists in Color, Form and Materials - or just emotional connections the design team didn’t originally anticipate. Situation:Imagine you have a successful product or line of product. Management has asked how they can extend the franchise. Naturally, there are a number of ways in which the refinements could go. Why not start with some input from brand loyalists? Find out what they really love about the product, and what they might improve or change in future iterations. Worst case, it confirms your hypotheses, but best case, they provide insight and inspiration for how to refine the product they love. Solution:By bringing authentic consumer voices and faces into the re-design process, you’re tapping the braintrust of some of the most loyal consumers. Alternatively, you could find a sample of people who used to buy your product, but don’t anymore. Lapsed consumers aren’t as hard to re-engage as someone who has never bought your product before. Perhaps there are some new features that could bring them back to the fold, but without input from them, you might not know what to alter with the existing design. Design firms were amongst the earliest adopters of MindSwarms, including influential studios like MNML, fuseproject, and Astro Design. They have used MindSwarms for a broad range of occasions. Situation:Before the design process even begins, teams need to understand the kinds of problems they are solving. Need-finding can be particularly challenging on tight budgets or with brands that are national or global where delving into need-finding missions can be time-consuming and expensive. Solution:Gathering mobile video feedback from consumers in their natural environments is an efficient and unique methodology to get a glimpse into their lives. Asking consumers to talk about frustrations and workarounds or to explain an ideal scenario has proved highly effective in unearthing new ways to identify gaps and zones of opportunity in the landscape. Situation:In a lot of cases, products are sold with very little sales assist on the floor. Especially as traditional brick and mortar brands try to cut costs to keep up with digital competitors. In cases where packaging can make the difference between consider and buy at the point of purchase, understanding how consumers think and feel about packaging can make or break a launch. Solution:As a packaging feedback mechanism, MindSwarms has helped client test packaging in several ways: (1) we have loaded PDFs of design concepts and had consumers react to them (2) we have asked them about existing packaging - to share likes/dislikes and (3) we have even shipped product and had consumers share “out of box” thoughts as they go through the process. In most cases, the issues consumers raised are eminently solvable in the design phase which save a lot of resources downstream in the development process. Situation:In a lot of cases, when asked about price points, consumers will guess lower than you think. That’s not to say you should follow what they say, but understanding if you’re a magnitude of 3X or more off the mark could help design teams either rein in expenses, or have marketing think about how to position the product differently. Solution:Getting consumer feedback via video on MindSwarms is a helpful tool to read body language - and see for yourself the nuances in their responses. Are they hesitant to say they think the price is fair? That wouldn’t show up on a quant survey. Do they have any benchmarks for pricing? One client who was working on a new product found that consumers guessed pricing to be between $15 and $300, meaning (a) they had no basis for how to compare price because it was an entirely new kind of experience and (b) the category was so emotionally-driven that they were willing to spend a bundle on the product. Situation:Companies talk about the last few feet at retail, but what about the first contact with a product via packaging? The out-of-box experience can be incredibly influential in setting the tone for how the longer-term relationship with that product will play out for consumers. Solution:Incredibly insightful feedback has been gathered via MindSwarms as it relates to the out-of-box experience. On video, you can see consumers struggle with features that should be second nature; watch the frustration on their faces mount as they try to figure out how to extract a product; or provide feedback on, say, how a blister pack diminishes their perceptions of a brand’s premium status. Situation:Despite the energy, time and resources that go into encouraging consumers to use products and services in a certain way, often times the actual usage and behavior differs. But why? Data is one way to understand how products are being used, but without the motivating “why?” behind it, it lacks context. Solution:By reaching out to consumers in their natural environments at the moment of truth of interaction with the product via MindSwarms, designers and companies can hear from real consumers in their own words how they use the product. They can find out what works and what doesn’t work to refinements and/or product extensions can be considered. Situation:With 9/10 new products failing at launch, there are overwhelming odds against any new product introduction. Why not have consumers try your product at home, at work, at leisure or about town where they would naturally use it? Solution:By shipping trial products to consumers all over the US or the world, companies can gather invaluable feedback to how consumers react to and use clients’ products. We’ve shipped sample food, and had consumers prepare and taste it on camera. We have shipped prototype razors, and had consumers record video from their bathrooms about their likes and dislikes. And we’ve shipped digital cameras to people to understand their out of box expectations and uses. Situation:The old fashioned days of qualitative research as a special event are long over. Ongoing data streams, cash register receipts and syndicated studies provide a treasure trove (albeit sometimes overwhelming) of what is going on in the market. But there hasn’t been a similar qualitative tool for staying abreast of qualitative consumers insights before MindSwarms. Solution:MindSwarms has been used very effectively as a way to track attitudes and behaviors over the longer term. For example, for a premium home entertainment brand, consumers reported their relationship to music, music brands, and music products over a six month period, providing the experience design team with invaluable insight into how their relationship with music changed. User experience was one aspect of the entire music realm for them that was not only evolving constantly, but also was impacting their relationship with new brands more than ever before. With the MindSwarms feedback, the client might have missed the trend towards greater integration of the user experience. Situation:It’s so hard to come up with a name for a new product or brand, with the millions of possible brand names available. Should it be empty vessel? Or evocative? Pedestrian or emotionally-charged? More importantly, how will consumers react to the name, and what imagery and associations do potential names trigger for consumers? Solution:MindSwarms has been a great platform for getting to deeper and more nuanced, emotional responses to potential product names. While on the surface, a brand’s intent might be singular, when exposed to potential names, consumers have surprisingly deep and multi-faceted impressions of names that have been tested using MindSwarms. Situation:The call comes in from the pitch consultant and it’s down to eight agencies on the long list. You realize you’re up against some serious contenders and statistically you have a 1-in-8 chance of making it to the Final Four. You need to get the business development wheels turning fast. You’d love to do some qualitative research to have a POV to start informing the creative brief, but OOP expenses are strictly managed and every group is asking for funding. You can’t afford a national sample, plus time doesn’t permit because you have one week to get your next round of pitch materials together. Perfect occasion for MindSwarms. Solution:A 15-person MindSwarms research. 7 questions per person gives you over 90 minutes video responses (participants have 1 minute to respond to each question). Bingo. You have a national or global sample of people answering very specific questions about the client’s brand or product that you can bake into your presentation or even edit together a quick video. Responses also “ship as they fill” so you and everyone on the pitch team can be reviewing responses as they come in. You can start to inform your internal teams about the consumer POV and have that influence the way they think about creative, media and every other aspect of the pitch. Situation:You’ve been given the task of helping a client launch a new product, launch an updated version, or create a brand extension. It’s up to you to develop the positioning. Ideally, you’d have a big budget and lots of time to get out in the field and do some primary research to gather insights from consumers and to begin to test some early hypotheses for ways to position the new offering. But the reality is you don’t have the time and/or money, but you feel it would be more responsible to get SOME insight from consumers in the process. Solution:A 30-45 person MindSwarms research. Most clients seem to want to get somewhere in the neighborhood of 50 people into a qual research (the equivalent of six focus groups in two cities) to have the confidence that the positioning is founded on a robust sample size. With 30-45 people, you’ll have enough insight fuel to shape a positioning strategy to present back to the client and have them feel like you’ve done your due diligence. By the time you’re finished with the research, you’ll either have helped refine/validate your initial thinking or be able to demonstrate that a particular positioning territory was most relevant and impactful with consumers. Situation:You have some advertising concepts either the client or the agency want to test. Maybe there is not enough time to do it with focus groups. Maybe one or two cities is not enough feedback for a campaign that will launch nationally. Perhaps there is some tension between what the agency thinks is right and what the client believes will do the trick. Or you’re advertising a product where there is no sales assist on the floor, so it’s important to understand one-on-one what consumers think of the advertising concepts. Maybe there isn’t enough money to run the concepts through a formal old fashioned testing methodology, or you don’t believe in the testing models they create. Enter MindSwarms. Solution:With MindSwarms, you can create a PDF of your concepts. Consumers open the password-protected file, read the ideas, then provide reactions by recorded video on their smartphone or mobile device. The primary benefit is you hear unfiltered what people have to say about your concepts. You can ask consumers to tell you what key message they’re taking away in order to evaluate the alignment with the intended strategy. You can ask about the language you use, the visuals included, the music that might accompany it… anything that helps you understand how relevant your concepts are. They can rank concepts, pick a favorite, or tell if or how it influences their perceptions of the brand or product. Situation:Ever wonder how your brand stacks up against the competition? With MindSwarms, you can find out how consumers think and feel about your brand and/or your competitors. What are the awareness levels of brands? What are the imagery and associations they make with brands? Which ones do they prefer and why? Working through the funnel from awareness to purchase, you can begin to understand the decision-making journey so you can hone in on where to focus. Maybe your brand awareness is lower than you thought. Maybe what you think your brand stands for is fuzzier than you hoped. Perhaps they prefer your brand, but buy another for reasons that are eminently fixable. Solution:Using MindSwarms, you can ask more general questions at the start of the research to frame broader perceptions in the landscape, then as the research evolves, get more specific about key issue areas that are bubbling to the surface in C-level meetings. Perhaps there has been a product miscue or QA problem. Maybe an employee has done something publicly that has garnered attention which threatens to tarnish the reputation of the company. Or perhaps there has been a break-out success of some kind that has transformed impressions of the brand and you want to understand how it made the brand more elastic. Situation:While focus groups seem to be falling out of fashion more and more, the reality is they are a mainstay of traditional market research for many companies. But there can be some shortcomings of focus groups: budgets usually dictate that you can’t afford more than 2 or 3 cities, it takes a few groups for patterns to begin to emerge, and it’s cost prohibitive to go back to consumers after-the-fact to test ideas. Solution:MindSwarms has been used as a perfect add-on tool for focus groups in a number of ways. It can add reach to your research; rather than coming back with qualitative results from 2 cities, you can add consumers from another 15 different markets to the sample and feel more confident that you’ve reached a truer national sample. MindSwarms has been used after focus groups have helped identify zones of opportunity for developed concepts. When a major computer hardware brand was looking to extend its footprint into the cloud, it used focus groups to cheat out frustrations and pain points. Following the groups, the design team came up with different concepts which were run past MindSwarms panelists to gauge their relevance. Our service has been used in advance of focus groups to help shape the in-field discussion guide by identifying key issues in consumers’ minds. Situation:In the era of big data, there is no shortage of quantitative information. And oftentimes, these quant samples are turned into quantitative profiling segments for targeting. The problem we’ve observed is that as great as these quant segments look on a spreadsheet, they don’t always connect or create empathy with the cross-disciplinary teams who are meant to create products or services for these segments.The question becomes how these quant segments or samples could be brought to life, to have a human face put on them. Solution:MindSwarms is a great tool for bringing quantitative information to life through the authentic voice and face of the consumer. Want to bring a segmentation strategy to life? Use MindSwarms to put a face and a voice to the quantitative numbers and see how teams respond to the human beings and their stories. Use MindSwarms to ask why. You’ll be amazed at consumer rationale, and it’ll help round out your understanding of motivations and behaviors so you can fine-tune your product or messaging. Situation:Early in the creative development process, a number of potential messaging territories have emerged. But which one is right? Which one is the most relevant? Which resonates most powerfully with consumers? Which one is most on-brand? Solution:MindSwarms is a great way to have consumers react to specific messaging territories. Create a PDF that we upload to a password-protected link. Each consumer opens the PDF, reads through the potential strategic messaging territories and responds in the moment in a IDI format; they’re not influenced by the kind of groupthink that focus groups can cultivate. The research can provide an ordering of preference/relevance in terms of which territories strike participants the deepest. Situation:Ethnographic style research is on the rise in a big way. Lots of companies now embrace the depth and visceral experiences that ethnography offers. The only hitch is that with smaller sample sizes, having a recruit that doesn’t quite deliver means there is a big hole in your research. You and the client and other team members spend a lot of time, energy and money traveling to different destinations so it’s critical that the interviewee be of the highest standard. Solution:MindSwarms has been a fantastic tool for pre-screening ethnography recruits. Researchers have very effectively used MindSwarms to cast for potential respondents for in depth, in home or in situ interviews. Using MindSwarms as a casting tool allows you to reach out to potential interviewees and begin to get a flavor for how they will respond. It can help bring to life how insightful they are, and help reduce the incidence of getting to an interview and finding out they are duds (despite having qualified through the recruitment process). The other advantage to using MindSwarms as a casting tool for in person interviews is that it’s an opportunity to gather information in advance that can fuel the research process, or even help shape a discussion guide. MindSwarms has been used extensively by independent researchers all the way to research professionals embedded in Fortune 50 companies. Historically, qualitative research has been expensive, slow and limited geographically. MindSwarms has shattered the barriers to collecting high quality video feedback from consumers across the world, in previously unheard of time lines. There are a number of key ways MindSwarms has been used by Researchers. Situation: There is no doubt of the value of ethnography in truly understanding consumers in their natural environment, whether that’s at work, home or play. But organizing, coordinating and paying for ethnography can be time consuming and expensive. Especially if your project is global. So how to approximate ethnography without leaving your computer? Solution: With MindSwarms, you can have consumers answer questions from any location. Need to look in their closets? Have a peek in their desk drawer? Wonder how they feel about a competitor’s retail location? How about how they organize their kitchen? How about your point of purchase materials? With our mobile video ethnography, you can have respondents weigh in authentically where you can actually SEE them in their natural environment, capturing the insights and nuances of the location. Situation: You have a limited budget - naturally - but don’t want to limit your focus groups to just one or two cities because you’re a national or global brand. Or, you’re doing a quant survey, and would like to bring the numbers to life somewhat so as you socialize the research internally, the insights get adopted and activated upon rather than ignored. Solution: Using MindSwarms, you can extend the reach of your traditional qualitative field work by adding a minimum 15 person study to your research mix. So, say, you decide on NY and LA for your focus groups; why not add 15 additional consumers from 15 other cities and see if/how the findings from your focus groups align with the rest of the country. Or, say you’re working on a quantitative segmentation study, MindSwarms is a great way to bring the profiles to life so your team can see for themselves the real people behind the numbers the gig data has created. Situation: You’re about to head out to do qualitative field work, but usually start to find patterns 2-3 groups into the study. But you wish you have a bit of a head start so you don’t just hit the ground running, you hit the ground with a bit of a sense for where the hot topics are so you can push the qual envelope further in field. Solution: By using MindSwarms in advance of fieldwork, you can not only start to gather data on your study but you can help refine the discussion guide so it’s ultra sharp by the time you get in field. For a major gaming brand, MindSwarms was used to help understand how women differed from men; by the time the fieldwork started, there was additional attention paid to women’s depth of involvement in the game, how they didn’t relate to the portrayal of female characters, and how core female gamers were actually very similar to core male gamers. That helped kickstart the process earlier and drive the project to deeper insights in field. Situation: A lot of time, energy and money is (well) spent doing ethnographies, but like with traditional focus groups, you don’t always know in advance how good the respondents will be, even if they look great on paper. How do you raise the odds that when you and your team show up to do an ethnography, that the respondent is going to be top notch? Solution: By using MindSwarms as a casting tool for ethnography, you can help identify great candidates in advance. You get to not only hear from them before you meet them - so you have additional fodder for the discussion guide - but you get to confirm that they really are the type of consumers you’re looking to spend your time with. There is nothing worse than having teams of people travel across the country or the world only to discover the recruit is a dud. Situation: Ever wonder how your product is really used? Want to take a peek inside a consumer’s home or workplace? Curious about what other products surround your brand in a consumer’s life? What does their electronics ecosystem look like? Solution: MindSwarms is a quick and easy way to get consumers to show you things in their life and tell you about them. Because they’re in their natural environment, they don’t have to lug their entire wardrobe to the focus group facility. By having them show you and tell you, they have great stimulus at hand to explain how they use something, how it makes them feel, or what the benefit is. It’s also a unique way to understand workarounds. For example, in a research for powdered mash potatoes, MindSwarms mobile video ethnography participants complained about the hygiene of the packaging simply by holding and talking about the product which led to a repackaging effort by the company. Situation: You want to know what’s in consumers’ closets, fridges, pantries, garages or man caves, but you don’t have the time or money to travel there to see for yourself. Solution: By having consumers respond by showing you their personal spaces, you get to see not only the products and brands they covet, you also get to see how they organize their space and what else surrounds your brand. You may think you know how your product represents itself, but until you see exactly how the people who buy your product interact with it, you may not truly understand it. Situation: You have a clear strategy and desired message defined in your brief, and you have advertising that you developed. But what do consumers “get”? Do they understand your key message? What is the benefit, to them? Do they make the connection between what you intended, and the execution? Solution: By adding a video or image link for them to click on and see, you can have consumers give you feedback about the effectiveness of your messaging. Maybe it makes more sense to have them view your advertising on a mobile device if that’s the primary place they’ll see it. Or maybe you’re wondering how a consumer feels about some new branded content you created which they’ll likely be viewing from their laptop; why not have them view it from their laptop, then respond in the moment so you get more immediate and visceral feedback. Situation: You have developed some baseline concepts, but are having internal debate on the merits of the different zones of opportunity. It would be expensive and time consuming to do traditional field work to gather insights, but with 9 or 10 new products failing at retail, can you really afford to only go on gut? Solution: By posting a link to your concepts (either in written or sketch form) you can gather early - and often - feedback on concepts in development. Find out how and why they relate to your ideas to you can iterate on them in virtual real time. We’re not saying you should be asking consumers what they want out of a future concept (because that can be hard for them) but having them react to a concept you have developed will usually surprise you in a good way. In our experience, good concepts usually get good feedback. But consumers will also usually surprise you with new ways of seeing the concepts you have been working so hard on that will move your process forward. Situation: You are running a business, organization or team. Word-of-mouth referrals are one of the most powerful motivators for new clients. While getting a quote from a client is nice to have for a presentation or website, there’s nothing like a video-recorded message from them in their own words to sway a potential buyer. Organizing a videotaped interview is logistically challenging or it’s simply too expensive. Solution: Use MindSwarms to ask them anywhere from 1-7 questions that only take them one minute to respond to. Bingo! Now you have a video testimonial from a key customer talking about your product or service in their own words. The link itself can be shared with others, embedded into a presentation, or downloaded and posted to a case study portion of your website. The beauty of smartphones and tablets is the sophistication of the video recording quality - in short, video quality looks fantastic and hearing your customer rave about your business is a powerful yet authentic tool to spread the word-of-mouth digitally. Situation: You’ve just landed a new job and have dozens - if not hundreds - of reports you have never met. And to top it off, they’re scattered across the world. You’re trying to wrap your head around who you have on your team, and who does what. Or, you’re curious what a diverse group of stakeholders internally feels about a key strategic decision, but they’re geographically all over the map and it’s like herding cats to organize a call or meeting to get them to discuss. Solution: With MindSwarms’ asynchronous capability, you can create up to 7 questions that each person responding can answer on their own time and location. You get alerts when each of them responds to you can stay current on who thinks what. You can even take their answers and curate a short video to playback key themes, areas where there is consistency and/or areas where there are divergent opinions that need to be ironed out. All from the comfort of your own desktop, so no expensive M&E to consider.